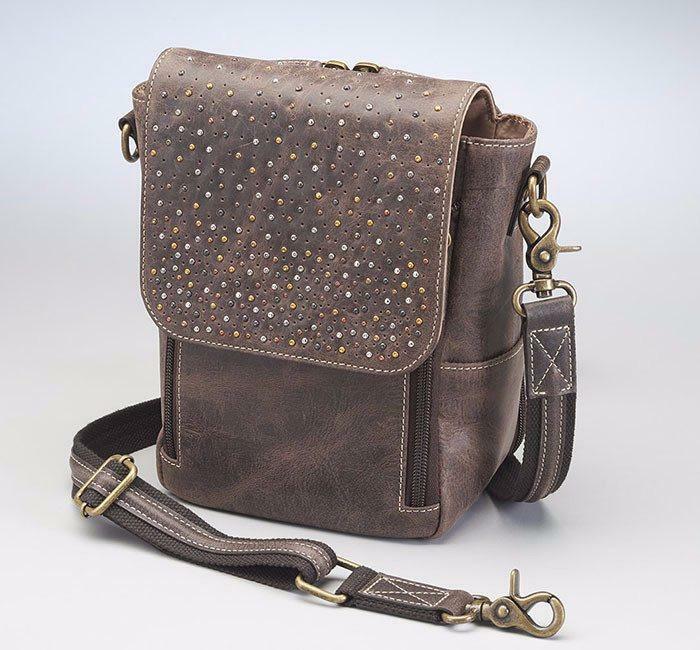 Beauty with exceptional performance under pressure with this Conceal Carry Distressed Leather Cross Body Satchel. The beautiful distressed leather is tanned full grain buffalo leather, the more the leather is used, the better it gets. It is wonderfully soft from oils infused in the tanning process plus it is very durable. 80-GTM/CZY comes with a slash resistant shoulder strap with 11 ply steel wire tastefully reinforced, fits across the body and is easy to clip on and off. The strap is adjustable and wide to help disperse bag weight. Hammered multi-color rivets decorate the flap over closure plus earth magnets close the flap. There is a front panel zippered organizer, 4 card slots, a double compartment which easily holds iPhone Plus and similar phone sizes. 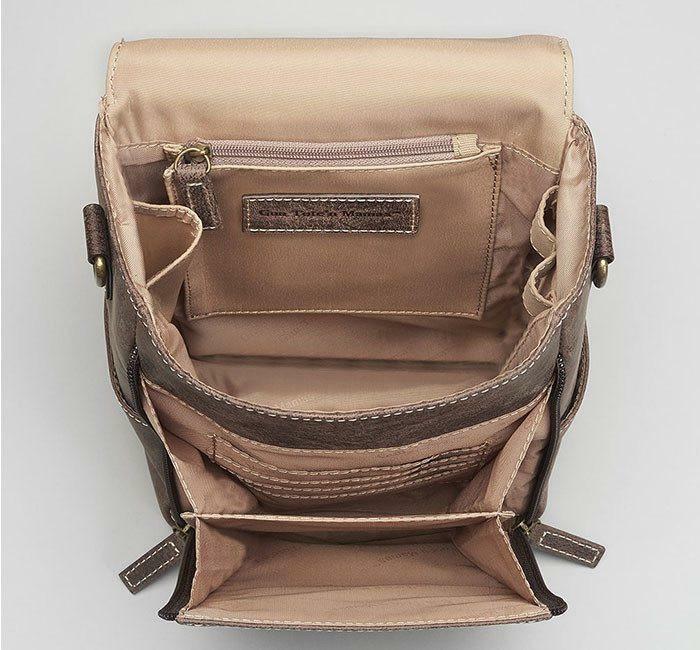 The main compartment has 2 side pockets for keys, inside Pepper Spray pocket, zippered pocket and a flashlight/Pen loop. All hardware is antique brass in color. 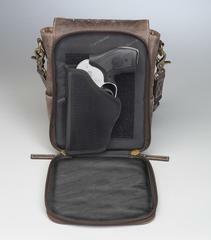 The gun compartment uses tone on tone brown nylon coil zippers for safety. This purse is fully lined with "easy-to-see-in" Khaki Gun Tote'n Mamas logo lining. 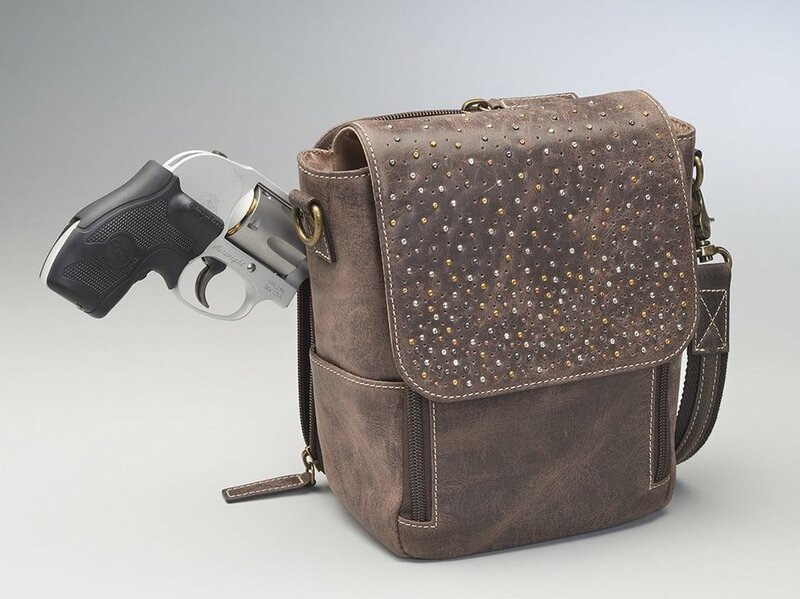 Guns tested with this purse: S&W 640 Hammerless Officers Special Revolver, Heckler & Koch 45 Compact, S&W MP Shield. Will fit similar sizes. Fully lined with "easy-to-see-in" Khaki Gun Tote'n Manas logo lining.